Clear skin. That's the dream isn't it? To remain blemish free. I have tried and tested so many products that claim to give instant results - some work, others well.. they really didn't work at all. In the end, it isn't about the products, they just clog our pores up even more. It's about the way you choose to look after your skin, what you place inside your body as well as what you place upon your face. 1. The Pre Make-Up PrepApplying foundation to a face that hasn't been washed or moisturised shall clearly give a different finish and result to one that has. 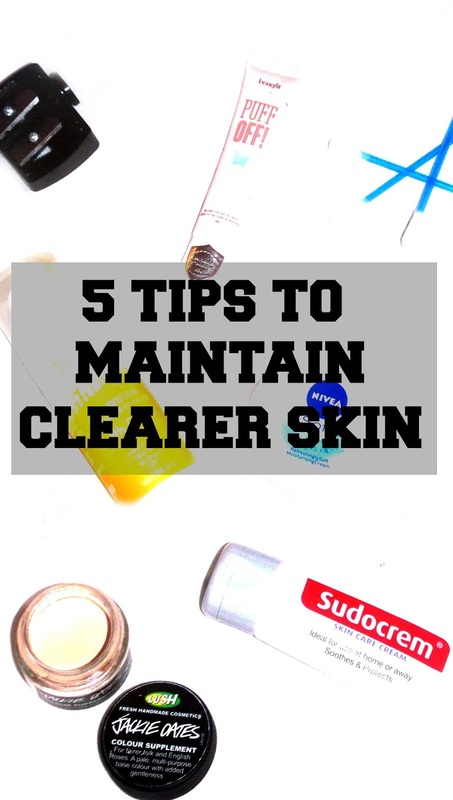 If you're going to wear make-up, you may as well make sure you compile a base of some much needed TLC for your skin before applying it with the works menu of make-up. After washing my face, I'll apply the Nivea Oil Free Day Cream; as someone with combination skin I've found Nivea is the only brand that can cater to my sensitive skin. This moisturiser helps to hydrate my skin without adding any excess, unwanted oils into my pores. To brighten and hydrate the under eye area, I use Benefit Puff Off; the iron tip applicator helps to soothe the under eye area, preparing it for concealer and powder. Did you know our under eyes 80% thinner than the rest of our face? This is why it's super important to ensure they are receiving the hydration they need. 2. Change up your skincare routineJust like with medication, our skin eventually becomes immune to the products we apply to our face; the skin loving ingredients stop having an effect on our blemishes and we're back to square one. Every three months or so I like to change up my facial wash, spot cream and even sometimes my moisturiser - this just helps to kick start the process of reducing blemishes all over again! 3. Use natural based foundationsOn those days where you're only running a couple of errands, if you feel the need to wear make-up; be a bit kinder to skin and use products with natural ingredients. A couple of my favourites are the Dusty Girls Earth Cream* containing ingredients specifically known to target acne, including: Nigella Sativa oil and Manuka Tree Leaf oil. Magnolia Acuminata extract and Chaulmoogra Tree Seed oil are further used to assist with skin repair and soothing. For only £11 this bottle of genius is everything your skin is craving underneath that heavy base of foundation. The Lush Jackie Oates colour supplement in my opinion is seriously, really under rated. The base of this product is made from oat milk which helps to keep your skin feeling a little more calm. Alongside honey, shea butter and aloe vera to soothe and hydrate. Retailing at just £9.50 I'd really recommend this to all of you pale girls out there! My skin has benefitted so much from the use of both of these foundations, soothing my blemishes and calming any redness. Although neither give a full coverage, they even out the skin tone perfectly creating the illusion of a 'your skin but better' effect. 4. Pamper time!Everyone loves a good pamper and your skin certainly does too. Lately I've been using the Sudocrem Skin Care Cream* to both soothe and protect my skin. As a multipurpose product this can be used to either moisturise, hydrate the skin and can even be used as a face mask during your weekend pamper. Lately I have been applying this to any blemish areas across my face, typically the nose, forehead and chin; a couple of hours before bed. I then remove using the Garnier Micellar Cleansing Water and there is clearly a visible difference. My blemishes appear less red, they have reduced in size and some have even completely disappeared. TMI but I had a fairly big pimple at the bottom of my chin earlier this week, after applying some Sudocrem to the area it had completely disappeared within 24 hours - I was so amazed! Sudocrem retails at just £2.11 here. Psst.. Did you know that Rita Ora, Cheryl Fernandez-Versini, Amanda Holden and Lara Stone have all hailed Sudocrem as their number one beauty secret?! 5. Drink plenty of water and eat a balanced dietLast but not least and I know this goes without saying but drinking more water really does have so many benefits for your skin. Lately I've been aiming to drink a glass of water alongside each meal that I have within a day, as a person who doesn't drink a lot anyway this has really helped to ease me into the process and my skin has cleared up a hell of a lot because of it. My skin has become less dry, more plump, more glowing and far less of a spotty mess of what it used to be. If you look after your body, it shall ultimately look after you; simple. What are your holy grail skin loving products?! DISCLAIMER: This post is sponsored. Anything that has been sent to me for review has been marked with an asterisk (*). All opinions however, are my own.